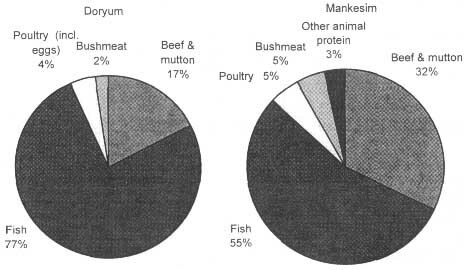 In addition to the contribution of bushmeat to food security through direct consumption, wild animals and their products are used as condiments to make meals more palatable, thereby improving the capacity of people to eat sufficient quantities of staple foods which are often bland and monotonous. Honey, produced by honey-bees, is regarded as valuable product worldwide. It may be used as a source of food, as a sweetener, as a tonic or medicine, and also as base for producing beverages. In many African communities, e.g. among the Maasai, honey also has an important social value in that it is used in various ceremonies such as marriage and circumcision (Chihongo, 1992). Honey is collected from the wild or produced on bee-keeping farms. It is estimated that there are approximately 2000 bee farmers in South Africa and honey production is reported at 3,200 metric tons per year (Maliehe, 1993). Bee keeping is obviously an industry with a lot of income generation potential for the rural people? particularly those living in the vicinity of protected areas where the low population pressure makes the reserves excellent for bee-keeping. Bee-keeping provides one economic justification for the sustainable management of the natural forests. Thus a number of "people and parks" projects in Africa are exploring or encouraging bee-keeping by local communities within reserves as a way of increasing benefits from the forests to the people and thereby enhance both food and income/employment based on forest industries. The honey produced may be consumed locally' transported to city markets for sale or exported. Est. monthy harvest (million kg) Game Birds 105.4 55.4 61.9. * Estimated number of farmers: Savanna region, 855,069; Deciduous forest region, 723808; Rain forest region, 1,008,208.